This Monster of a Cake is something I make every Halloween. 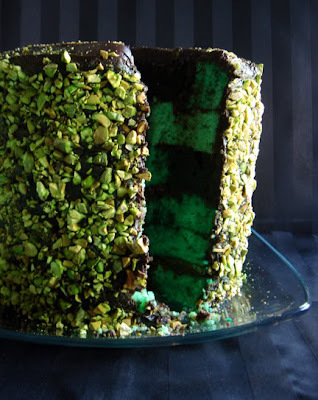 Pistachio cream, chocolate ganache with a little Kahlua swirled in and five layers of cake is what makes this dessert over the top. 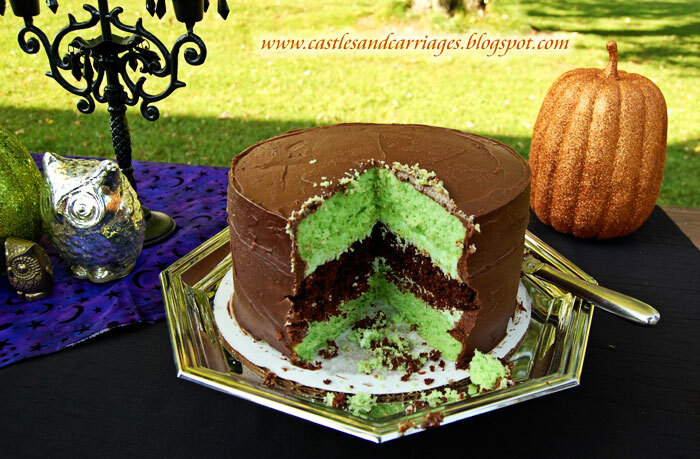 An interesting take on this recipe uses Nutella to piece together chunks of cake to make a Frankencake! Spray 4, 8-9" round cake pans with nonstick spray and flour. Line bottom of pans with parchment paper, spray parchment; set aside. Prepare devil's food cake mix according to package directions. Divide between 2 pans and bake according to package directions. Prepare white cake mix according to package directions, add green food coloring. Divide batter between 2 remaining pans and bake according to package directions. Combine pudding mix, cream, sour cream, milk and powdered sugar in a large bowl. Beat at med speed with an electric mixer until stiff peaks form, refrigerate at least one hour or until ready to use. Place chocolate in a large bowl. Combine cream, butter, liquer and vanilla in large sauce pan. Bring to a boil over med-high heat; pour over chocolate whisking until chocolate is melted and smooth. Refrigerate for 45 min to an hour until spreading consistency is reached. Spread Pistachio filling evenly between layers (about 1 1/8-1/4c each). Spread chocolate ganache evenly over top and sides of cake. Wow... You had me at pistachio pudding! This has to be a wonderful taste combo. Thank you for stopping by my wee blog and leaving such a lovely comment. o my goodness!! i want some of this cake! you made my mouth drool... yum. Wow wow WOW!! My grandsons (and their Grammie!) would LOVE this! !